Made by Goosh and Mumma. The final painted roses adorning our shoe rack! 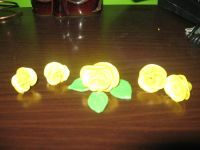 Here’s a quick and simple how-to for some Quick and simple roses. – take some atta. Firmer than what you make rotis with. – make small balls out of it. Say about 1cm diameter. – press the balls out into flat ovals. Doesnt have to be even / fixed shapes. – roll the ovals into a rose, petal by petal. 4 petals are sufficient for a rose bud.